The area definitely lived up to my expectations, and then some. 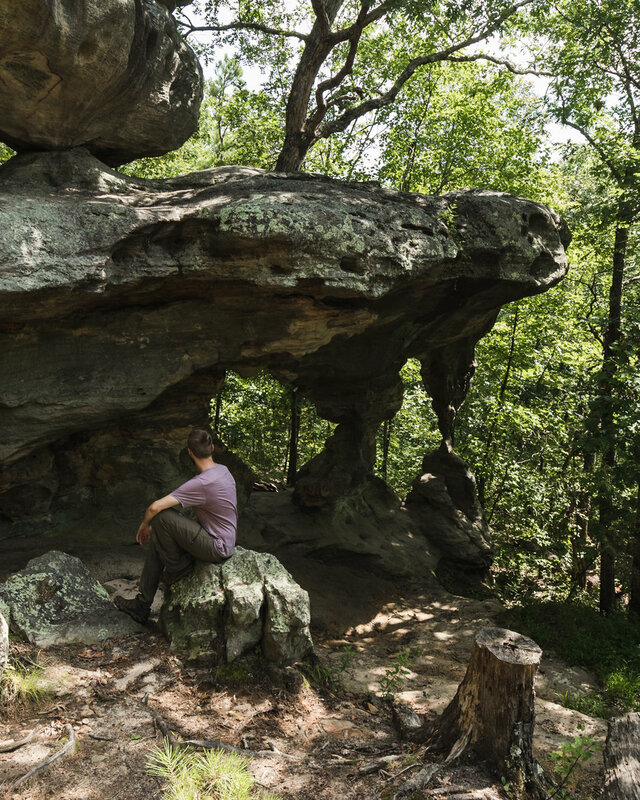 There are many different types of rock formations around Missouri, and it seemed as if you could find every one of them at Pickle Springs. It was exactly what I had hoped for, but the area presented a paradoxical challenge: despite being an absolutely stunning location, it was hard to make great photographs there. I find it amazing that such a small area can contain such a diverse array of structures. Primarily sandstone, it took eons to form what we see today. A combination of ancient oceans, glaciation, plateau upheaval, and erosion lead to these geologic marvels. 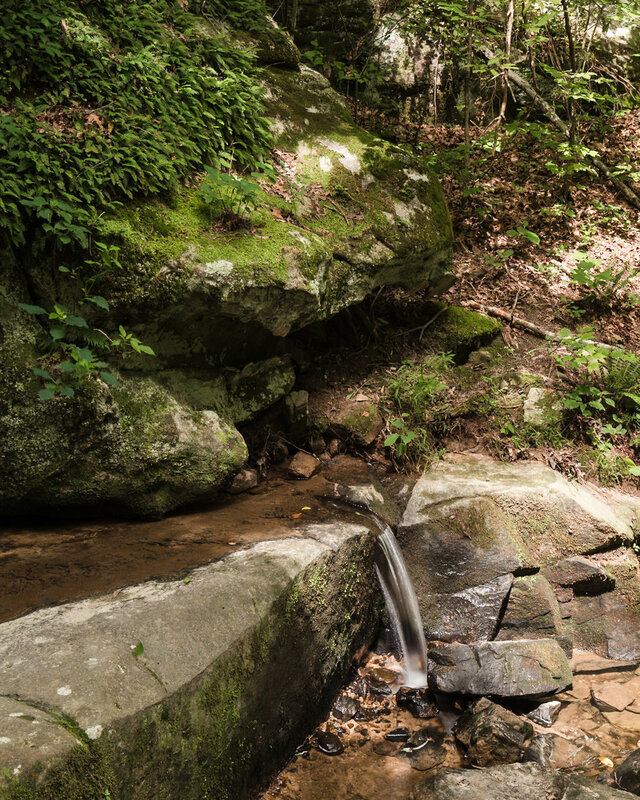 It's easy to lose yourself in wonder as you make your way along the trail. The area is so impressive in fact, that Pickle Springs was designated a National Natural Landmark. Not only is Pickle Springs remarkable because of the geology, but also because of its diverse biology. Among the hundreds of plants that grow there reside a handful of plants known as glacial relicts. These are plants that grew in Missouri when the local climate was much cooler and wetter thanks to glaciers. These plants are still able to exist thanks to the unique geology of the area. The canyon walls create conditions that produce micro-climates reminiscent of those the plants first lived in. I think this is in part why the trail is named A Trail Through Time. As I stated above, as you walk along the trail you go from one feature to another. When you first start on the trial you are greeted by a large board with a map detailing what you are about to see. On the two mile route there are 12 formations called out, with names that range from Dome Rock to Cauliflower Rocks, and Owl's Den Bluff. It's an incredible hike that I think you just have to experience in person. Throughout the forest a number of smaller unofficial trails cross with the main path, which makes it easy to accidentally get off track and wind up lost. In a couple areas I had to be careful which fork I took, and I came a cross at least one group who had lost their way. 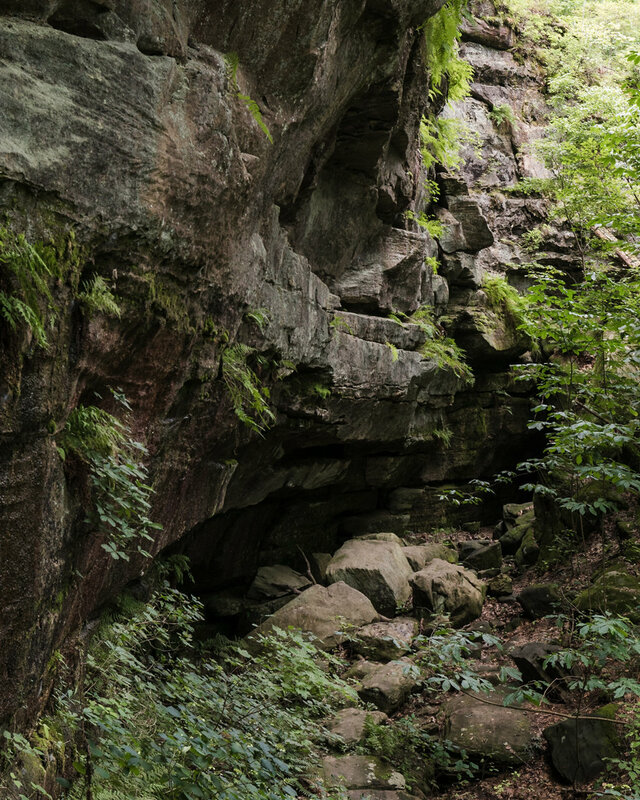 Speaking of other people, Pickle Springs is one of the most popular Natural Areas in Missouri. I arrived pretty early, and there were already two other cars there before me. As the day progressed I came across more and more people walking the trail. While I typically prefer hiking alone, I didn't mind the others this time. The children out with their parents just made the whole place feel livelier, and I didn't hear too many complaints about the long walk or the heat. In order to preserve the natural formations you're not supposed to climb on anything. It was hard for me to resist the urge, so I can't imagine how hard it would be for someone less than half my age! As I alluded to at the beginning, photographing at Pickle Springs was surprisingly challenging. You may be wondering how, if it's truly as amazing as I've said, I was having trouble make photographs that are just as amazing. Well, the answer is that just because a place is beautiful, does not mean that it will make a good photograph. Many of the rock formations where too large for me to fit in frame, or if I could, the photograph ended up uninspired because it lost all sense of a focal point. This was particularly true on Dome Rock. It was this vast rocky knob that overlooked the forest. The scene left me awestruck, yet I ran around searching for a composition that would capture how impressive it was only to come up empty handed. When faced with a situation like this it can feel as though you won't be able to make a satisfying photo. There is a way though. Instead of trying to capture the impossible vastness of a scene, you can create much better photographs if you focus on small details. These more intimate scenes better demonstrate your eye for detail and composition, and do a much better job at evoking the emotions you felt while creating the image. I wish I had gone to Pickle Springs Natural Area earlier instead of putting it off, but thankfully the years of build up did not sour the experience. I had high expectations, and yet I was still blown away by the phenomenal beauty of the hike. When visitors ask me to take them to explore the Missouri outdoors, I know exactly where we'll go.